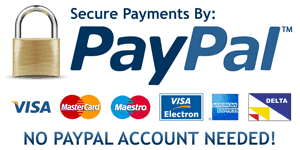 For your protection & peace of mind, both payment methods take place over PayPal’s secure pages – the worlds leading online payment processing company. We are therefore never in possession of any of your debit or credit card information, which is only ever entered on a secure payment processing page hosted by PayPal. You can pay with your credit or debit card even if you don’t have a PayPal account.